Jewel orchid is finally getting some of the attention it deserves. 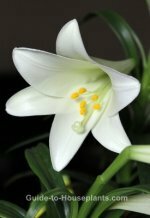 Although it only blooms for a few weeks in the winter, its exceptional foliage makes it a worthy house plant all year long. Velvety, maroon-black leaves sport dapper pinstripes, giving these orchids an aristocratic flair that's all their own. A network of red and cream veins are prominent on the dawsoniana variety (shown here). The tall creamy white flower spikes that appear in winter seem just an added attraction to the dazzling foliage. Not as well known as other orchids, the Ludisia discolor may be difficult to find in nurseries. It is formerly known as Haemaria discolor. This is one of the few terrestrial orchids that grows well indoors. It doesn't go dormant; keep it warm and moist year-round. No blooms? Although these orchids will tolerate low to moderate light levels just fine, you won't get the blooms without bright (indirect) light. Feed them orchid fertilizer to stimulate blooming. Happy with humidity. I've found only one challenge with this easy-to-please orchid. This tropical native wants higher humidity levels than is usually found in a home. I've found that a pebble tray or a room humidifier works like a charm. I'm sometimes surprised how much humidity can drop indoors during the winter. One of the handiest devices I've found is an indoor humidity monitor. 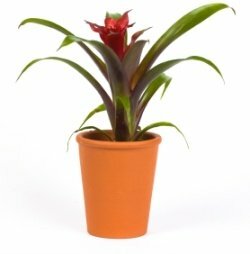 Put it near your plant to get an accurate reading because different ends of a room can vary. Gimme shelter. Smaller orchids fit beautifully in a Wardian case, which retains humidity and shelters plants from nearby air vents. Lining the bottom of the case with moist sphagnum moss will boost the humidity for this tropical orchid. Light: Bright indirect light year-round. Ludisia discolor grows well under flourescent lights. Avoid direct sunlight, which causes leaf color to fade. 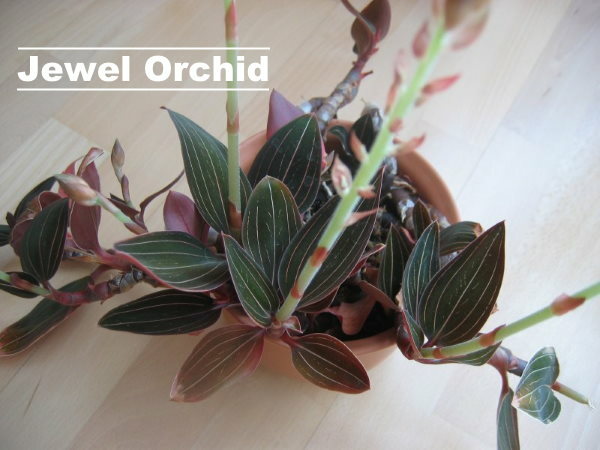 Water: Jewel orchids are terrestrial orchids and require constant moisture around their roots. However, don't keep the potting medium saturated because the roots will rot. Humidity: Moderate, preferably 50-60% relative humidity. Fertilizer: Feed every 2 weeks with orchid fertilizer while plant is growing and flowering. Propagation: Cut a stem into small pieces, each with 2 dormant buds. They'll root easily in moist potting medium.